NASA's 30-year space shuttle program has literally relied on a cast of thousands to launch astronauts into orbit. Those diehard space workers have given their passion form in a new photo that shows a life-size shuttle made only of humans. In the new photo, released March 18, thousands of shuttle workers at NASA's Kennedy Space Center in Cape Canaveral, Fla., gathered in an empty parking lot to pay tribute to the space shuttle program. A time-lapse video of the event shows the crowd gradually converging to create the life-size outline of a space shuttle surrounded by a ring of people. 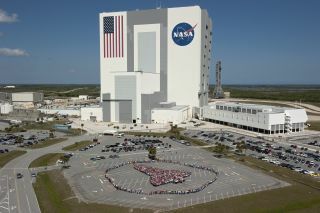 NASA's massive Vehicle Assembly Building provides a backdrop for the image. The 52-story structure is where space shuttles are attached to their external tanks and twin solid rocket boosters before launch. A closer view of the life-size space shuttle created by thousands of NASA Kennedy Space Center employees standing side-by-side outside the Vehicle Assembly Building on March 18, 2011. "The unique photo opportunity was designed to honor the space shuttle program's 30-year legacy and the people who contribute to safely processing, launching and landing the vehicle," NASA officials said in a statement. NASA is retiring its three flying space shuttles (Discovery, Endeavour and Atlantis) this year to make way for a new space exploration program aimed at sending astronauts beyond low-Earth orbit. President Barack Obama has directed NASA to shift its space exploration goal from returning astronauts to the moon to sending a human expedition to an asteroid by 2025. NASA's space shuttle fleet began launching into orbit on April 12, 1981 when the Columbia orbiter blasted off on the first mission: STS-1. The space agency will have flown 135 missions by the end of the program. After their final missions, all three space shuttles will be retired to museums. NASA is expected to announce which museums will get the three space-flown shuttles, as well as the test orbiter Enterprise – which was used for landing tests only – on April 12.